A Big Walnut wrestler gets his hand raised in victory. Brody Lawhun got hot from behind the arc, knocking down five 3-pointers, including a pair as part of a 16-4 fourth quarter to lead Big Walnut to a 44-32 win at Marion Harding in non-league play Saturday night. Lawhun finished with a game-high 19 points and Jagger Barnett added 10 to lead the Golden Eagles (10-6), who have matched last season’s win total with six games remaining. BW hasn’t won 11 games since the 2011-12 season, which was the last time the team finished over .500 at 12-10. Tabias Thompson-Reece had 11 points to lead the Presidents (5-9). Boys Varsity Basketball beats New Albany 52 – 35. OCC BBK Final: SR Brody Lawhun w/14 pts and JR Kegan Hienton w/14 pts. Game Recap: Leading the way for the Eagles were senior Erin Boehm with 19 points and junior Avery Schone with 16 points. The win brings their record to 13-3. Game Recap: Johnny Lemaster led the boys on a nice bounce back win by throwing both the Match high in series and games shooting a 440 with games of 240-200. Liberty was led by Andrew Holycross’s 315 series. Game Recap: The Boys lost a tough match to South but were led by Bryan Mengels 436 series with games of 224-211 to lead all boys. Brayden Buch also added a 214 as part of his 362 series. This is Big Walnuts only 2nd lost of the season and leave them tied for 2nd in the division. Meet Recap: For the first time in the boys finished 5th and qualified for the 8 team Championship roll off at the Central District Tournament led by Jacob Bownes 674 series. Jacob led Big Walnut to a 5th place finish while earning all Tournament Team Honors. Big Walnut qualified 5th to face Westerville South in the 8 team Championship roll off. Unfortunately they fell in a best of 5 Baker roll off to the Tournament runner ups South. South beat Big Walnut 3 games to two. This is another great accomplishment for the Boys 2019 Bowling Team. Game Recap: Big Walnut won a very exciting match by 3 pins against South. Their were Career high games by Kaitlyn Morrison who threw a 263-180 to finish with her 2nd highest series of 443. Caitlyn Lambert also threw a 211-168 to help the Eagles hold on to very tight match. Westerville South was led by Katie Ball’s series of 379. This puts Big Walnut in 2nd place in the division to continue the Girls best start to a season. Game Recap: Big Walnut continues hot start behind Kaitlyn Morrison’s series and game highs of 371 by rolling 190-181. Liberty was led by Breanna Withrow’s 319. Meet Recap: The Lady Eagles continued a season of first by finishing 8th to qualify for 8 the team championship Roll off. They were led by Kaitlyn Morrison’s 543 and Autumn Leidtke’s 504 to finish 8th for the 8 team bracket roll. Big Walnut continued on to eliminate Tournament 1st seed and tournament favorite Westerville Central 3-0 in best of 5 game roll off. They moved on to eventfully fall to Tournament Champion Delaware in a 3-1 roll off where they lost by only 6 pins. This was another great weekend for the Big Walnut Bowling Program. Meet Recap: The Big Walnut Swim and Dive Team competed on Saturday, January 26th in the OCC Capital Division Championship Swim Meet against New Albany, Canal Winchester, Newark and Groveport High Schools. Both the boys and girls team did an outstanding job with the boys swim team taking second overall and the girls team taking third place. The team has really demonstrated improvement throughout the season and continues to work hard as they prepare for their final senior meet on February 1st and sectionals on February 9th. The team had many personal best times. The team also placed in the top three earning medals in several of the events. Meet Recap: The BW Wrestlers split up this weekend to attend a varsity tournament and a JV tournament. The Varsity took 10 wrestlers to the tough Watkins Memorial Tournament while the JV took 6 to the Whitehall JV Invitational. Varsity wrestlers finished 8th behind tournament champion Sr. Josh Halbakken (170). Josh went 5-0 in the tournament and reached his 100th career win. Juniors Max Lenz (220) and Ryan Coletta (152) placed 2nd and 3rd respectively. Andrew Parker (106) placed 6th, while Christian Jodrey (120), Levi Piceno (126), and Wyatt Lenz (195) finished 7th. Rounding out the varsity were Lawrence O’Malley (145) and Gavin Miller (160) finishing 8th. Coach Renner, Reall and Halbakken were extremely impressed with the toughness of our young team and the work of our upperclass leaders. Several wrestlers headed to the Whitehall JV Invitational at the same time. Due to the young program, the coaching staff felt this was an opportunity to get some experience for the team. Tournament Champion Freshman Christian Takatch (138) led the team to a 6th place finish, even though they only brought 5 scoring wrestlers. Cali Lang (106) and Noah Hines (285) placed 3rd at both ends of the weight classes. Carson Leasure (126) placed 4th, while Grayson Segars (132) took 5th and Michael Hurst (195) placed 6th. Great job to our wrestlers. Next up is the opening round of the State Dual Team Tournament at Marysville. Josh Halbakken picked up an individual title at 170 while Max Lenz and Ryan Coletta finished second and third at 220 and 152, respectively, to lead the Golden Eagles at Saturday’s invite at Watkins Memorial. Halbakken finished a perfect 5-0 on the day, picking up his 100th career win in the process. 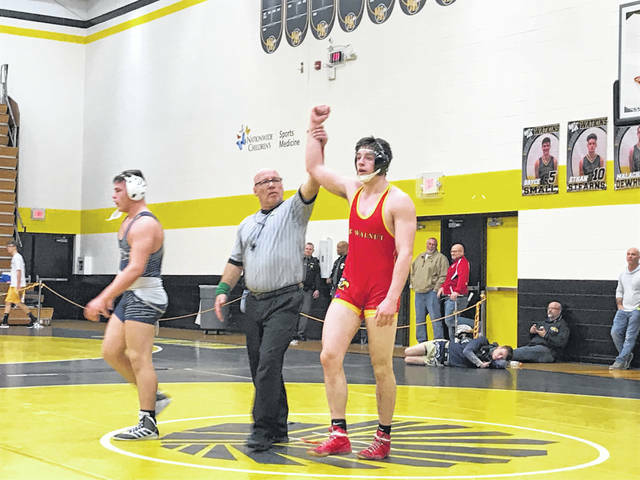 https://www.sunburynews.com/wp-content/uploads/sites/48/2019/02/web1_bw-wrestler-wins.jpgA Big Walnut wrestler gets his hand raised in victory. Information for this story was provided by the coaches and athletic director; along with Ben Stroup and Michael Rich of The Delaware Gazette.